We are anxiously awaiting safe ice, so this would be a good time to remind folks of some ice safety procedures. 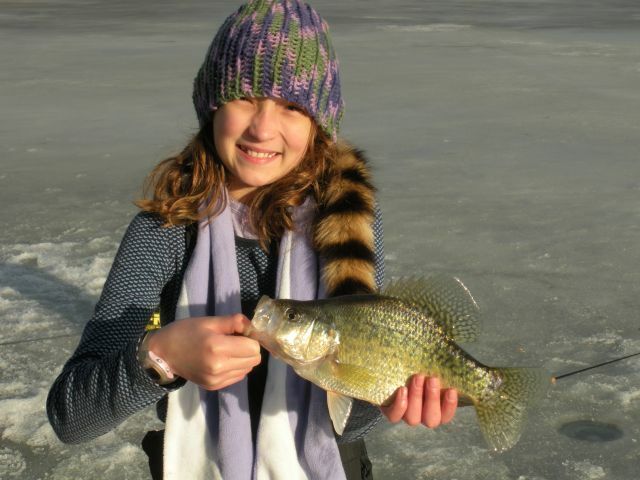 First ice is usually high-quality, clear, hard ice and can be safe to fish when it gets 3 inches thick. Four inches of new ice is better because that gives you some “margin for error” as ice thickness may not be uniform across a body of water. Water bodies are not getting close to freezing until water temperatures get to 39 degrees F. At 39 degrees, water is at its densest, so once it reaches 39 it can rapidly cool even further and that cooler water is less dense and “floats” on top. At 32 degrees ice crystals can begin to form. BUT do not assume that just because temperatures are below freezing that we are “making ice”. Remember that the water has to cool before it gets close to the freezing point, and the more water there is the longer it takes to cool. That is why relatively small bodies of water are the first to freeze (and also the first to thaw). Also remember that if the wind is blowing or if there is any water movement (i.e. current) that can prevent ice formation. If you get a layer of snow on top of the ice, that actually insulates the ice and inhibits ice formation. We will see what happens the rest of the week here in Nebraska, but I do not like the snow we just received, nor do I like the forecast for the rest of the week. What seems to be great news for ice anglers could actually be the worst weather scenario–a skim of ice with snow piled on top of it. Snow on top of the ice can prevent ice formation and disguise ice conditions. If we have snow on the ice it will be even more important that you are double and triple-sure that ice is safe. Snow on top of the ice also weighs ice down and as it “sags” water will be forced up through cracks and creat slushy conditions on top. If you see that slush on top, you again must be very careful that it is safe. The slush will eventually freeze and make the ice thicker, but until then you will have to keep your feet dry and make sure that there is in fact enough ice to be safe.How to know if the ice is safe? Well, you have to check it. 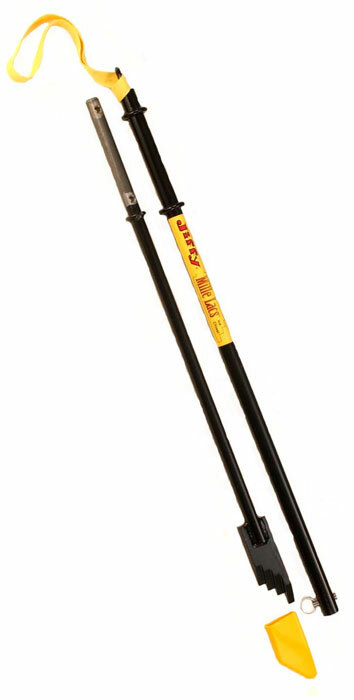 You can use your auger and drill holes every few yards to be sure. I prefer a “spud bar” or ice chisel. You can use that tool to strike the ice as you walk along and by doing that you will be able to “feel” and listen as the ice chisel strikes. You can also use the spud bar to punch a hole and check the ice thickness. Oh by the way, use an ice skimmer with inches marked on the handle so you are not just estimating thickness–we all know how anglers exaggerate lengths (Ha). It is always a good idea to take a partner, especially if you are venturing onto new ice. Make sure you have some rope along, just in case, and I like to have a pair of “ice picks” around my neck. 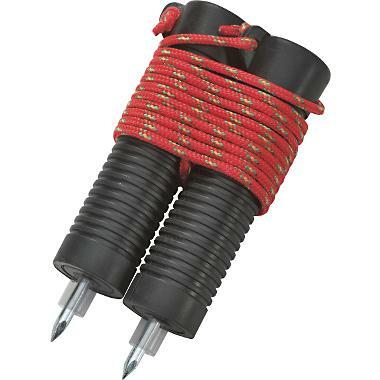 The ice picks can be used to get a grip on the ice to pull yourself out just in case the unthinkable happens. Wear a life jacket if you are unsure of ice thickness, or if you want to add something to your Christmas list, Arctic Armor makes ice fishing parkas and bib overalls that are waterproof, warm and THEY FLOAT! http://idigear.com/arcticarmor.php . Have a change of clothes in the vehicle in case you fall through and get wet. Once you get out you will still have to avoid hypothermia; you will want to change into dry clothes immediately. A fire source (e.g. propane heater) or something to start a fire with also would be an excellent idea. I would highly recommend that anyone venturing onto the ice this winter familiarize themselves with Dr. Gordon Giesbrecht and his work at the University of Manitoba, http://www.umanitoba.ca/faculties/kinrec/research/people/giesbrecht.html . Take a look at that website, watch some of the videos and read some of the articles. That is hands-down the best information I have seen on ice safety, knowing what the dangers are, and how to survive! I will push the ice fishing “envelope” as much as anyone I know. I have had ice fishing partners that will tell you that I will push the early and late-ice “envelope” more than anyone they know. But you have to be safe. I have never gone through the ice other than busting through the edge right at the shoreline, and I hope that never changes. Make sure it is safe before you go, and make sure you know what to do in the worse-case scenario. I may push the envelope, but I can also say there have been days when I wanted to ice fish really bad because I knew we would whack some nice fish, but I walked away from it because I knew it was not safe. I believe this blog post is very important because there will be folks this week who assume it has been more than cold enough to make safe ice. That may be true, but I am betting we are going to have to be patient because the ice is not going to be as thick as some assume it will be. Be careful out there. Wait for it, it is coming! Cold and snow dang it to much snow for my liking but we are going to have ice soon if not already hope to get out there before long. Yep, I think we will have some ice to fish on soon. Just make sure it is safe! Don’t you have some school work to do or crappies to catch or something?